The Grand Design Momentum toy hauler fifth wheel is widely considered as one of the best on the market. This RV has been specifically designed to take toy haulers to the next level with added features and more attention to style in not only the living portion but also the garage. With this vehicle, you do not have to compromise on comfort to bring along the outdoor toys that make for an amazing RVing trip. 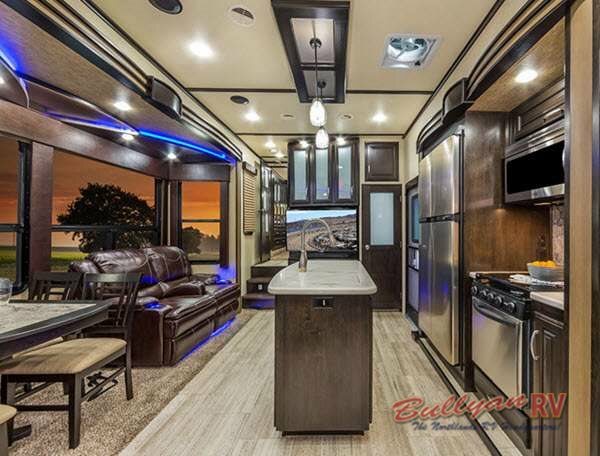 Take a look inside the Grand Design Momentum Toy Hauler! With the Grand Design Momentum, you will have ten different floorplans to choose from, and some of them can have up to five slideouts. Therefore, this will be one of the most spacious toy haulers available to you. One of the areas that has been heavily upgraded in the master bedroom area. This model comes with not only an elegant master bedroom with a walk-in closet, but it also comes with a master bathroom complete with a skylight above the shower and a porcelain toilet and vessel bowl sink. The large spacious interior has room for everyone! 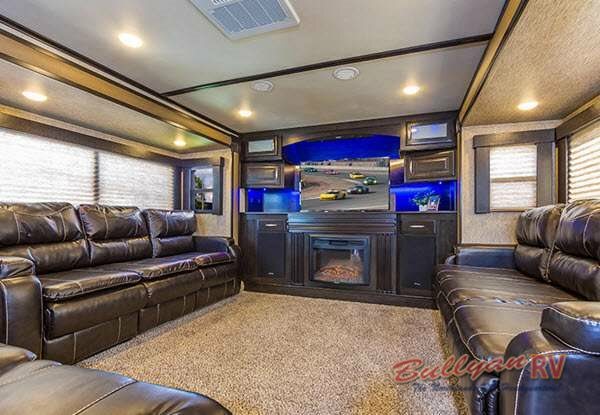 The living areas of this toy hauler also come with some incredible features that will make you more comfortable anywhere you travel. The seating in the living room, for example, has some design features to make them unique such as a sofa with heat and massage built right into it. With the sofas plus the theater seats and dinette set, you will have numerous places to sit and relax. The Grand Design is concerned with more than just comfort, however, and the addition of the central vacuum system is a practical and functional feature intended to make life on the road easier. Added features in the living room add to your comfort and ease while RVing! 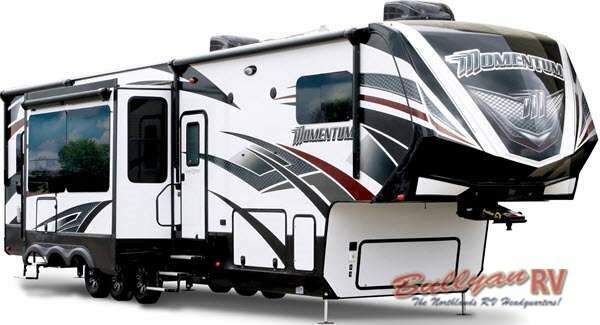 The Grand Design Momentum toy hauler fifth wheel is made to raise the bar in the world of toy hauler. With it, you no longer have to decide between fashion and function. We would love to tell you more about this incredible vehicle, so please contact us or come by our location to see them for yourself. Then, you can start taking your outdoor toys along with your RVing trips and create the perfect blend of relaxation and fun!